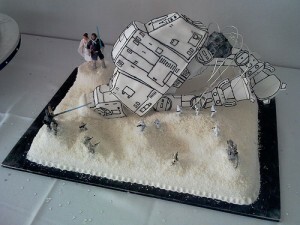 Well it took 11 months…but I am now proud to feature AWCB’s first Star Wars wedding cake. 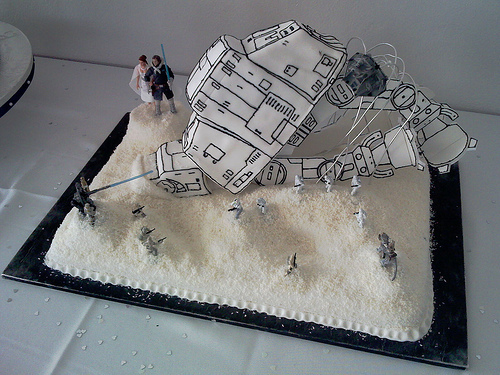 At least my first Star Wars wedding cake. Brooke may have featured one but I don’t think so. Well…I’d love to tell you all about what exactly is going on here but sadly…I cannot. All I can tell you is that it appears to be snowy and Princess Leia and what I am assuming is Hans Solo (or this could be Natalie Portman and Hayden Christensen) are hanging out with a very large robot thingy. This combined with the Star Tours ride at Disney World pretty much ends my experience with the Star Wars franchise. Have I watched them? Of course I have. When I was 16 they were re-released in theaters and my boyfriend-at-the-time thought it would be awesome if we went to see them on the big screen. All of them. At midnight. Let’s just say I had no idea they were so science-fictiony. I am sure there are several people groaning at this post…loudly. I’m not saying I disagree with the franchise or anything. Personally, I dig Harry Potter on a level that’s probably unhealthy so I get that people have their things. This…just isn’t mine. But hey. That’s still a pretty awesome cake.